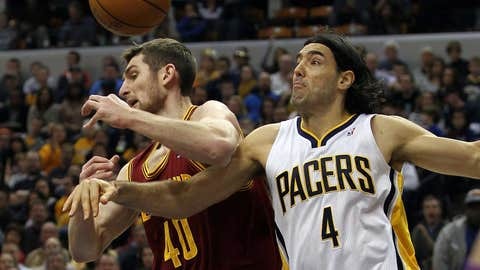 Cavaliers center Tyler Zeller and Indiana Pacers power forward Luis Scola battle for a rebound during the fourth quarter at Bankers Life Fieldhouse. Sometimes, the other guys are just better than you. That’s why it’s really no surprise the Cavaliers dropped a 91-76 decision at Indiana on Tuesday. The Pacers put up a fight in the Eastern Conference finals last season, and came within a win from the NBA’s biggest stage. They understand how to elevate their game when it means the most. The Cavs, of course, do not. But this isn’t necessarily an indictment of the Cavs. For most of three quarters, they played hard and smart and like a team in the truest sense. They just aren’t as good as the Pacers, certainly not on the Pacers’ home court in front of a sellout crowd. The Cavs don’t have a wing like Paul George, a 7-foot-2 center like Roy Hibbert, or the edge or arrogance of the Pacers overall. These Pacers have been there before. The Cavs have been nowhere. It showed in the final 12 minutes, in winning time, when Indiana broke open a close game by going on a 26-10 run. They pushed the ball, they dunked, they laughed and exchanged high fives. The Cavs, on the other hand, just ran out of gas. They committed turnovers, stopped defending the right way, settled for ugly shots. They had hoped to be closer to a team like the Pacers (25-5) this season. The gap is still fairly wide. It’s pretty clear that the Cavs (10-21) need some help. The front office is hard at work to find just that, working the phones and seeing if exiled center Andrew Bynum might bring anything worthwhile in return. The possibilities of that, as of this moment, seem shaky — although it could change at any moment. That’s just how trades work. The Cavs crashed the boards and defended as well as they have at any point this season in the first half. They actually held a 44-41 lead at halftime. They were in it, in fact, all the way until about the 4:00 mark of the fourth quarter. But just like so many times this year, and in this era of Kyrie Irving, Tristan Thompson and others, everything just sort of stopped. It doesn’t always happen at the end of games, but it almost always happens. And don’t misunderstand. That’s not to call out Irving or Thompson — although neither is showing the type of consistent rise you would hope for from third-year players. Thompson grabbed 13 rebounds, and that’s fantastic. But he’s often not the same player on the road as he is at The Q. That has to change, and to be frank, probably should have by now. 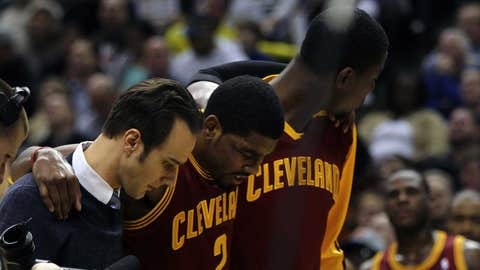 Meanwhile, Irving took just nine shots, finishing with 10 points and five assists. It may have something to do with the fact he injured his knee in the third quarter, returned to the game in the fourth, but admitted the knee felt weak after. He will have an MRI on Wednesday. More than anything, though, it was just too much George (21 points), plenty of Hibbert (19) and not enough know-how from the Cavs. And there’s no pretty way to spin this bottom line right now: The Cavs were aiming for the playoffs, but here they are, at 10-21 overall and 2-14 on the road. That’s really no better than the Utah Jazz (10-24) — and the Jazz are supposedly tanking for the NBA Draft lottery. Still, the Cavs did well for all but 12 minutes Tuesday vs. the best team in the league. If they decide they can take anything from this game, well, 2014 would be a great time to start putting it to practice.